Skype is rolling out a major update today, one that aligns the chat service’s focus more closely with social media, going beyond mere peer-to-peer communications. Chat is still at the core of Skype, to be sure, but now the Microsoft-owned service wants you to share with your network as much as you talk to them. It also has a fresh new look, one that’s bursting with color, animated squiggles and graphics that pop. You’ll also notice plenty of inspiration taken from popular social networks like Snapchat and Instagram. Here are seven important things you need to know about the next generation of Skype. “This is the biggest change to Skype since 2006 when we added video,” Amritansh Raghav, corporate vice president, Microsoft Skype, told us about the redesign. Skype, he said, has been completely rebuilt from the ground up. The catalyst for Skype’s transformation stems from a changed philosophy; Raghav said that while at first it was appropriate to be a peer-to-peer chat service, Skype has since shifted to a “mobile first, cloud first” strategy. Microsoft observers will note this is the tech giant’s motto of recent years. Social media – and how users interact with the important entities in their lives – is another driving force behind Skype’s new look and features. Speed and ease of accessibility are hallmarks of the new Skype as well. Jumping into a chat is a quick tap away, and finding bots is equally easy. The overall design and user experience is fresher than before, and the camera – the all-important implement of our modern mobile life – is always one swipe away. Of course, communications are still at the heart of Skype. Assembling a group chat or video call takes a few taps, and within chats you can access bots and other Add-ins so you can take actions. For example, you can pull details from the Stubhub bot into a chat if you and your friends want to purchase tickets to tonight’s big game, or the Expedia bot if you want to share airfare pricing details. Search has also been completely revamped in Skype. Powered by Bing (natch), heading into the new Find panel lets you search the web, browse images, pull up movies playing in your area and browse local restaurants. Add-ins such as Giphy, BigOven, Upworthy and YouTube are also searchable if you’re looking for a funny clip or reaction gif to share with your buds. The whole approach is for a more integrated experience that keeps you in the Skype app, ready to connect at a moment’s notice. It’s a radical redesign, one the breathes new life into Skype. The new Skype introduces a brand-new feature called Highlights that lets users share the big moments from their day in one convenient reel. Comprised of photos and videos captured by you, Highlights is in the same vein as Snapchat Stories and Instagram Stories. It’s a way to share meaningful moments (or, truthfully, probably silly recaps of your day) with whomever you like among your contacts and groups. Not only can you add emoticons, text and other edits to your Highlights, but your contacts can also react to your post with emoticons or messages. We weren’t able to test out Highlights in our beta software, but on paper the feature is relatively straightforward to access. You swipe left from your homescreen into the Camera panel, take a photo or video in the camera, then post it to your Highlights and share. You are able to see Highlights from contacts who share their clips with you as well. Highlights will be up and running for all users when they receive the new Skype, we’re told. While borrowing from the popular Snapchat Stories, it’s unclear how much use Skype's Highlights will truly get from users. We see the feature best suited for vacation roundups or other big moments you want to share in recap form, but not necessarily every day use. Despite a potential lack of legitimate purpose, Highlights is clearly another effort by Skype to mix in elements from social networks to liven up the overall experience. A major change coming with the new Skype is greater personalization. Right off the bat you’re asked to select a theme, and from there you can customize the aesthetics of your personal Skype experience with different hues. Personalization extends to conversations, too. Skype is all about reactions, specifically with emoji, so you can let the people you’re talking to know exactly how you feel with icons that appear next to a message or within a video call. Totally necessary? Not really, but it adds a layer of fun and interaction that other chat services often lack. In the new Skype, the camera is fully integrated into the app. It’s now always a right swipe away from within a chat on your phone, letting you snap a photo or video and immediately share it or save for later. You can also select the Capture panel to quickly get into your camera. Faster access isn’t all Skype’s camera has added, however. There are also new editing features to add text annotations, stickers and filters. 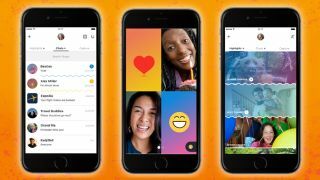 Skype doesn’t go as far as Snapchat with its new photo customizations, but it’s clearly had an eye on what the ephemeral chat service and Facebook Messenger have been up to when it comes to dressing up photos and videos with effects. We had fun playing around with the paint brush tool and emoji, but the options were fairly limited in terms of what you can add. We'll see if users gravitate towards Skype's stickers et. al. in the say way they use Snapchat filters (our bet – it's not likely). As previously mentioned, a new Find panel in Skype wants to be your all-in-one resource for information you can turn around and put into your chats. Swipe left from inside a chat and you’re taken to the Find section. Here, you can do a Bing web search without leaving the app and browse images, movies and restaurants. Any images, movie details or restaurant blurb you find can be shared in a chat with a quick tap. Add-ins and bots also live in the Find tab. You can search for a gif in Giphy or a clip on YouTube or a BigOven recipe and easily share it into a chat. It’s important to note that while you’re on a video call, anything you share from the Find section will show up in the chat room, not on video. While Skype has been rebuilt from the ground up with a fresh new look and smartly integrated features, it may prove a bit confusing at first. There is a lot going on, and navigating inside the app and using all of its features may not come easy to all. It didn’t for us, however as with most things, extended use allowed us to tease out features we initially didn't realize were there and grow accustomed to what’s new. If you’re not a regular Skype user, you may experience the same learning curve, though even seasoned users will be faced with new icons, tabs and an overall shake-up that takes getting used to. One issue we had is that with so much swiping and general compartmentalizing, it’s easy to get disoriented within the app. You forget how to get back to where you started, and home becomes relative as you simply try to retrace your footsteps. This is especially stressful on a call when you’re on camera but swiping around the app or trying to take a photo or write a message on the screen. For those who like a simple, streamlined chat service, the new Skype could be feature overload. Skype may have gone a bit overboard trying not to seem outdated in a world run by Snapchat, Facebook and Instagram by adding so much, though it does attempt to maintain its identity as a chat platform first (the Chat panel is always front and center, for one). Still, whether this fresh yet somewhat familiar approach appeals to current Skype users is a big question; the new features could feel superfluous and turn those who just want to chat away. What's more, the new design probably isn't enough to convince those who use the aforementioned platforms as well as Google Hangouts and iPhone’s FaceTime to make a permanent switch. The big question: When can you get it? The answer is the new Skype is rolling out today, first on mobile and then desktop. There are some caveats, however. Android users will get the new Skype first, followed by iPhone. The new desktop version will roll out to Windows and Mac in the summer, and full availability will be completed by the fall. One last programming note: the Skype preview version of Cortana, Microsoft’s digital assistant, is headed to the US market at the end of June. We're told Skype aims to learn how users engage with Cortana before deciding on further expansion.